Organic Themes has rolled out our Restaurant Theme! Check out the delicious demo now! 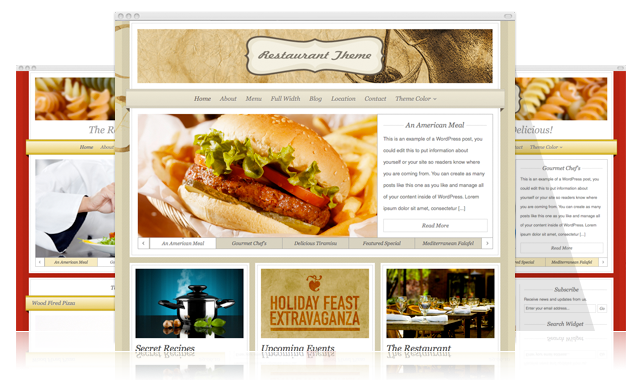 This theme is the perfect web solution for businesses in the food related industries. The purchase of the Restaurant Theme pack includes 3 beautifully designed color variations; Creme, Spicy and Classy. The theme also takes advantage of new WordPress 3.0 features including Custom Backgrounds and Menu Management. If that wasn’t enough, we have included a Menu Page Template that can be used to display the full menu of your restaurant! Updating your restaurant’s website will no longer be a hassle when taking advantage of the Restaurant Theme for the user friendly WordPress platform. Giving you more time to perfect your trade. If you want to learn more about setting up your Restaurant Theme, check out our detailed documentation. The drop-down doesn’t work correctly in Opera. This theme Pretty good! clean and professional,I love it. On the homepage featured bar, you have 5 different areas. Can I have 6 showing? How flexible is this? The options allow you to have up to 5, mostly due to the limited space for titles. But, you can modify the options to allow as many featured areas as you’d like. We can help you with that in the forums. Does this theme even work? The screenshots look good, but I can’t view the live demo, it’s been down for at least a week!? Is it not showing up using that link? Is there a demo link somewhere that is directing to a different location? Strange, for some reason I’m seeing the default Twenty Ten 1.0 theme at that link when using Firefox. In Safari I am able to see the Restaurant theme correctly. I’ve just purchase a restaurant theme, and i have tough time dealing with the home page. I want to make it more or less look like ur home page, but when i uploaded theme to wordpress I only have one main area, unlike original theme, where homepageboxes are kind of separate. wow Beautiful Theme. Thank for sharing to me. I admit even I have a lot of friend developer but they can’t design theme beautiful like you.